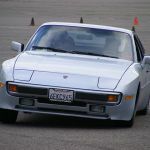 I've been searching the forums for info on recommended alignment settings for a 968, but most of the info is for 944s. What I'm hearing is -2.5 front, -2.0 rear camber, 1/8th inch toe in front, 0 toe in rear and I haven't seen anything on caster, so I'm assuming factory on that. My 968 now has camber plates and Mo30 sway bars with RE71R tires. Any thoughts on if I'm in the ballpark for alignment settings? I would try -3.5~4 front, all you can dial in the rear (-3 ish) 3/32"~1/8" toe in rear (for predictability) and straight ahead toe front or even 1/16" toe out (for turn in). Toe numbers are cumulative (ie 1/16" per side to get 1/8"). Adjust camber based on tire wear/temperature bias. If you set the rear toe at zero the car will tend to "wag it's tail" under braking and likely be unpredictable on corner exits with occasional *surprise! * oversteer. I tried zero rear toe in my car one time, it was a wrestling match. I'm assuming stock-ish spring rates and corner balancing. "A finish is a win! Moderation is the key! More whine!" thanks Dave. I think the springs are 200 # . Make an appointment at Mirage Intl in Miramar. Tell Jae what you are trying to achieve then listen carefully to his response. Settle on your solution. Show up on time with a credit card. Go for a walk or brewery visit for a couple of hours. Pick up your car. Issue resolved.